One year ago today, we were driving home from a family vacation to Florida. We were pulled over at a roadside stand in rural Alabama buying a few pounds of boiled peanuts. My cell phone rang. I looked at the caller ID and my heart started racing as I saw our attorney's number pop up. With our spotty reception, I deciphered that she was calling to tell us about our referral. She said that she was sending me an email right then with our baby boy's picture and his information. I couldn't stop shaking. I paid for the peanuts and got in the car and looked at Kamron and told him that we had a son. There are a few times in a marriage, where the look on your spouse's face is etched in your brain. The moment that I told Kamron about our new baby- was one of those. Such connection. Just magical. We had no internet connection where we were out in the middle of nowhere. We were chomping at the bit to find somewhere with some wi-fi so we could bust out our laptop and see that first picture. After what seemed like an eternity, we found a KFC with a big sign boasting that they had wireless internet access. We all raced in, sat down at a table and fired up the computer. Ladies and Gentlemen: We’d like to introduce you to our son! Isn’t he precious?!? We are absolutely over the moon! His Congolese name is Dieudonne. (Pronounced Dyuu-doh-nay) It is French, meaning “God Gives.” Could that be any more appropriate? 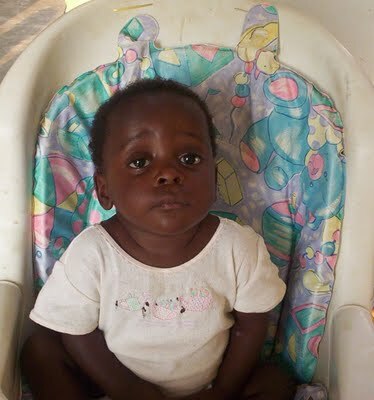 He is around 6-7 months old and was abandoned at the orphanage in July. He appears to be healthy as a horse! I have been staring at his sweet picture for hours and am already madly in love! When Sadie first saw Dieudonne’s pictures she exclaimed, “He looks just like Noah!” Not sure about that, but he definitely looks like he belongs in our family! We will begin court proceedings in DRC this week. From here, if things move quickly, we could bring him home in as little as 3 months. If things move slowly, it could take up to 6 months. Please pray that our sweet, precious, little boy continues to stay healthy and that the courts can move at lightning speed so we bring him home as soon as possible. I am just dying to squeeze him and love on those sweet cheeks! Get your pumpkin bread on!